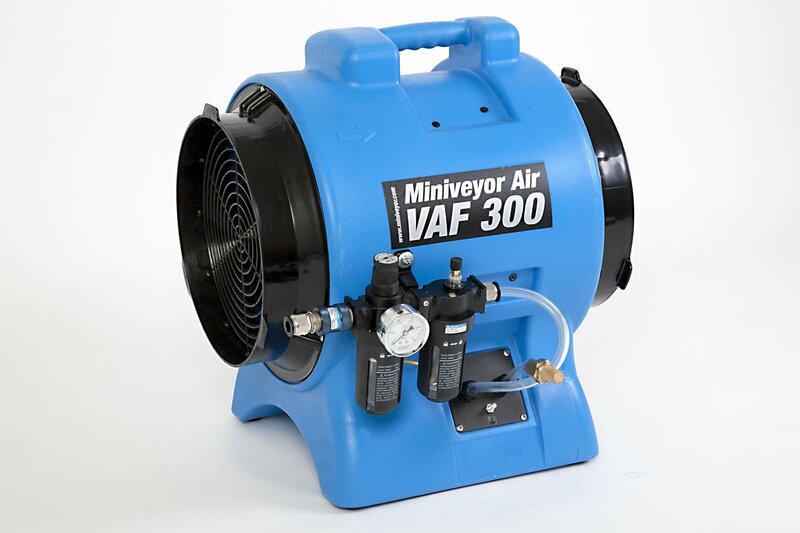 Where fumes, smells or dust occur, the Miniveyor Air and VAF Air vane axial fans can move contaminated air out of the building or confined space. They effectively exhaust fumes, ventilate confined spaces, and increase the flow of fresh air. The VAF fans can also act as blowers, moving clean dry air into a building that has been flooded, moving the damp, humid air out. The rugged VAF ventilators easily withstand blows without denting, giving less downtime and greater productivity and come with an industry leading 10 year warranty on the body. The VAF fans and blowers are the professional choice for portable dust and welding fume extraction. The VAF blowers can be used as portable ventilating and confined space exhaust fans or extractors. For confined spaces that require a powerful ventilator and that meets strict hazardous area requirements, the VAF-300P-FRL delivers high performance with uncompromising safety. Used where compressed air is available - from air lines or portable compressors, and where electricity is forbidden. The safe design of the air motor ensures against dangerous sparking. The high performance motor is totally enclosed. The unit is complete with its own air filter/regulator/lubricator which filters out impurities in the air stream, provides oil to the critical motor parts, and allows users to regulate the air flow for maximum performance. The VAF Air and Miniveyor Air fans and ventilators combine dependable power with practical design. The stackable design saves valuable floor or storage space, the large handles enable effortless manoeuvrability, and anti-skid rubber feet for steady operation. The VAF series fans work on both positive and negative airflow making them equally at home extracting fumes and dust or blowing fresh clean air into a confined workspace. The rugged design is durable and weather resistant. VAF fans and blowers are the professional choice for portable dust and welding fume extraction. The VAF blowers can be used as portable ventilating and confined space exhaust fans or extractors. We’ve listened to what our customers have told us and our new 2nd generation designed range has incorporated some of the changes asked of us. This includes - an improved fastening system for the ducting attachment to the fan, preventing the ducting falling off during use - a tougher duct ring to prevent breakages - an integrated moulded grill to reduce parts and an improved motor mounting to help withstand blows. We are so confident with the new improved designs the VAF range now come with an industry beating 10 year warranty upgrade on the fan body. Miniveyor Air…Tough Fans for Tough Jobs! The Professional Choice for Portable Dust and Fume Extraction. VAF Air Ltd, together with our sister company, Miniveyor Products Ltd (MPL), are specialist suppliers of confined space equipment to a diverse industry base globally. Our team has been involved in the supply of vane axial fans to the European market since the mid 1990’s and now the Miniveyor Air range of blowers, fans and ventilators has been established as a leading brand worldwide. 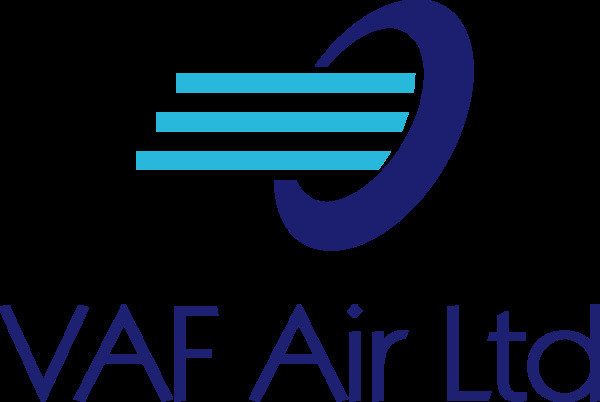 VAF Air are the specialist ventilator division of MPL and global distributors of the Miniveyor Air product range.